Today, Brighton & Hove City Council, represented by the Leader of the Council, Cllr Warren Morgan and the Mayor of Brighton & Hove, Cllr Mo Marsh, signed an international commitment to work towards eradicating HIV as a public health threat. 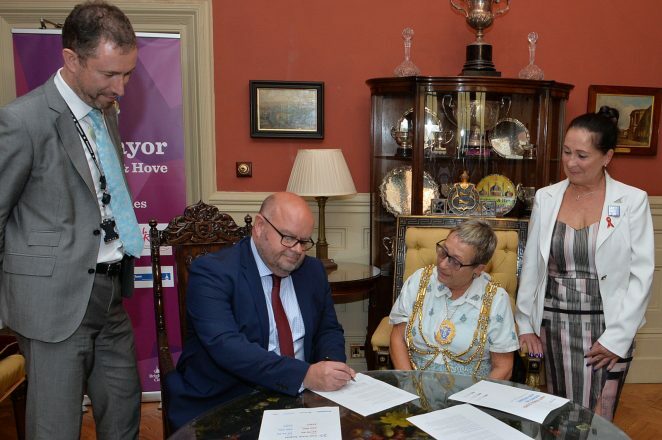 The Paris Declaration on Fast Track Cities Ending AIDS, was signed at a gathering in the Mayor’s Parlour in honour of the historic occasion. *90% of people living with HIV to be aware of their status. *90% of people who know they’re HIV positive to be on treatment. This city has the highest number of people diagnosed with HIV outside of London. Joining the initiative provides access to the excellent resources of the international Fast Track Cities team. This will enable the council to identify where their efforts at a local level should be concentrated. If you would like to find out more about The Paris Declaration on Fast Track Cities Ending AIDS, please visit their website here.